This blueprint discusses in considerable detail the measures that we will be undertaking to achieve the objectives outlined above. The document is divided into six chapters that examine in depth the strategic initiatives that will define the next phase of reforms in the Judiciary. 1). Chapter One focuses on interventions that will be geared towards enhancing access to justice. 2). Chapter Two pays attention to the clearance of case backlog. that will be put in place to deal with this problem. 4). Chapter Five expounds on the new Judiciary Digital Strategy. 5). Chapter Six addresses Leadership and Governance issues that the SJT will give priority to. Whereas the SJT provides the broad institution-wide framework for better service delivery, and whose implementation will be overseen by a Committee headed by the Deputy Chief Justice, the next phase of transformation will be undertaken from a bottoms-up perspective. Therefore, each court station is required to prepare its own Service Delivery Charter on the basis of which its performance shall be judged. The real transformation of the Judiciary will only be achieved if the citizen experiences a qualitative difference in the services we offer to them. 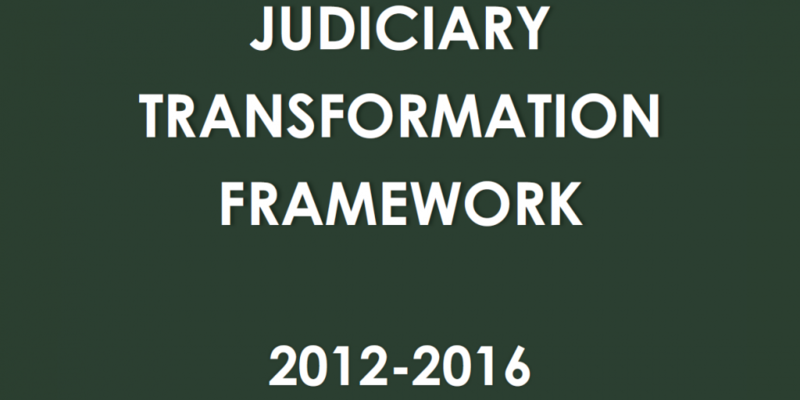 This 2014-2018 Strategic Plan for the Judiciary appropriately, therefore, marks a redoubling of our transformation efforts. As our theme suggests, we are “building on the early successes and lessons of Judiciary transformation.”. More specifically, it provides fresh impetus and guidance on how we must now broaden, deepen and sustain transformation for the long-term. At the same time, it retains a clear and present focus on the directive mandate that the Constitution provides. We are still in the “business of justice”.